(from page 2 of the 1966 Collection) Raven Black 1966 Mustang hardtop, front end view. (from page 2 of the 1966 Collection) Raven Black 1966 Mustang hardtop, rear end view. (from page 6 of the 1966 Collection) Front view of Aldo's 1966 Black Mustang Sprint 200 hardtop. The 1966 Sprint 200 package was promoted as the Millionth Mustang Success Sale. The Sprint 200 was a sport package specifically designed for the base 200ci 6 cylinder engine which were plentiful. Other Sprint options included center floor console; painted side accent stripes (color matched with the car's interior); deletion of the chrome rear quarter ornaments; a set of deluxe 48 spoke, blue center wire-style wheel covers; and a "Sprint 200" decal on the engine's chrome air cleaner cover. (from page 6 of the 1966 Collection) Rear view of Aldo Rivas' Black 1966 Mustang Sprint 200 hardtop. The door data tag on this car reads: 65B hardtop body style, A Raven Black exterior paint, 66 black luxury seats, 11B scheduled to be assembled on the 11th of February 1966, 74 ordered in the Seattle area, 2 2.83:1 rear axle ratio, 6 C4 automatic transmission. (from page 17 of the 1966 Collection) Raven Black 1966 Shelby GT-350H Tribute owned by Dale Smith from Adelaide, South Australia. This was our featured Attitude Of The Week for the week starting August 21, 2011. The car has it's original 289ci V8 and a manual transmission. Dale tells us more, "After having an awesome Emberglo coupe, I fell in love with the GT350H and just had to have one. A real one is out of my budget so the next best thing was a tribute. So this is the fruits of my labour - a fully restored 1966 GT350H replica with all the good bits. Looks and drives great. I am really thrilled with the end result. It truly is a wonderful car, which looked after should live on forever." 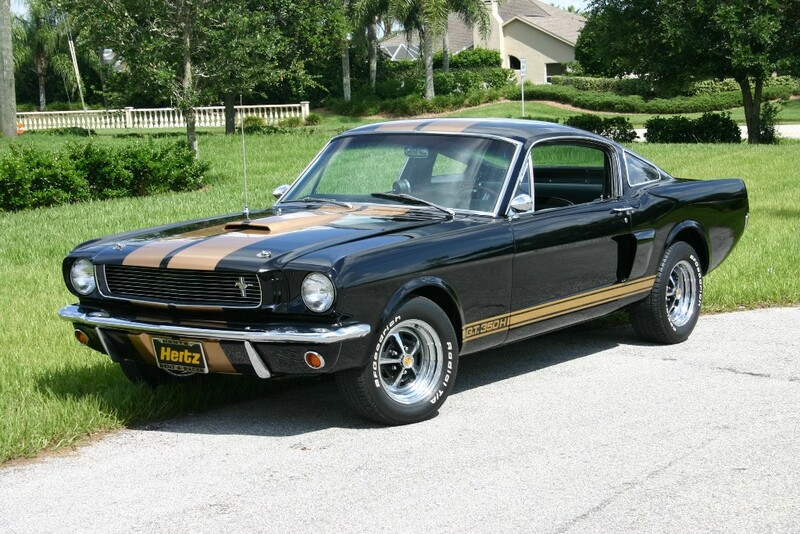 (from page 17 of the 1966 Collection) Dale's Raven Black 1966 Shelby GT-350H Tribute has gold Lemans stripes, GT-350H rocker stripes, and chrome Magnum 500 wheels. (from page 17 of the 1966 Collection) The H in GT-350H is for Hertz. These H cars were built special for Hertz Rent-a-car to be rented to the public! How come I always get a Neon when I rent a car. (from page 17 of the 1966 Collection) The Lemans stripes are carried on to the trunk and down the rear tail light panel and lower valance. It has a metal GT-350 emblem on the tail light panel. (from page 17 of the 1966 Collection) Raven Black 1966 Shelby GT-350H Tribute, right front view. It wears a set of vintage style Firestone Wide Oval tires. (from page 17 of the 1966 Collection) Those gold stripes look amazing. (from page 22 of the 1966 Collection) Raven Black 1966 Mustang GT hardtop owned by Daniel De Bono from Australia. This beauty is our featured Attitude Of The Week for the week starting November 18, 2012. Daniel tells us more, "This 1966 factory GT coupe just spent the last 36 years with it's previous owner in Greensboro, North Carolina. Frank (now 82 years old) was the second owner as he'd bought it from the original owner who ordered it as a customer order back in late November 1965. It was optioned out nicely with an A code engine, power steering, a banded windscreen, green glass, pony interior, Rally Pac, long console, rear speaker, and AM radio to complement all the GT extras. It arrived in Australia in January of this year with 68,336 original miles. It still has many original features including the trunk liner, spare white wall tire, jack and ratchet, all panels and interior are also original (except for the carpet and mats), All bolt on parts such as power steering pump, 4bbl carburetor, intake manifold and so on are original numbers matching as well. This beautiful example of American automotive design still has the buck tag attached and is accompanied by the original factory build sheet of which I found the last piece (Bottom left hand corner) stuck under the passengers seat just a few weeks ago." (from page 26 of the 1966 Collection) Raven Black 1966 Mustang hardtop with 1966 Shelby Mustang wheels and a 289 cubic inch, 2 barrel, V8 engine. (from page 26 of the 1966 Collection) Raven Black 1966 Mustang hardtop with added 1966 Shelby Mustang wheels. (from page 26 of the 1966 Collection) Rear right view of a Raven Black 1966 Mustang hardtop. (from page 26 of the 1966 Collection) 1966 Raven Black Mustang hardtop rear left view.